Posed wedding portraits are beautiful and artful, yet there is something about a real couple sharing a real moment and acting naturally that makes for especially memorable wedding photography. Located at the Cedar River Watershed Education Center in North Bend, Washington, a forested and mountainous area about 45 minutes east of Seattle, this photo was taken as the couple walked around the beautiful grounds, just taking in the day and each other. I was obscured behind the bushes with my 70-200mm leaving them to themselves and I love the obvious joy of this spontaneous moment. 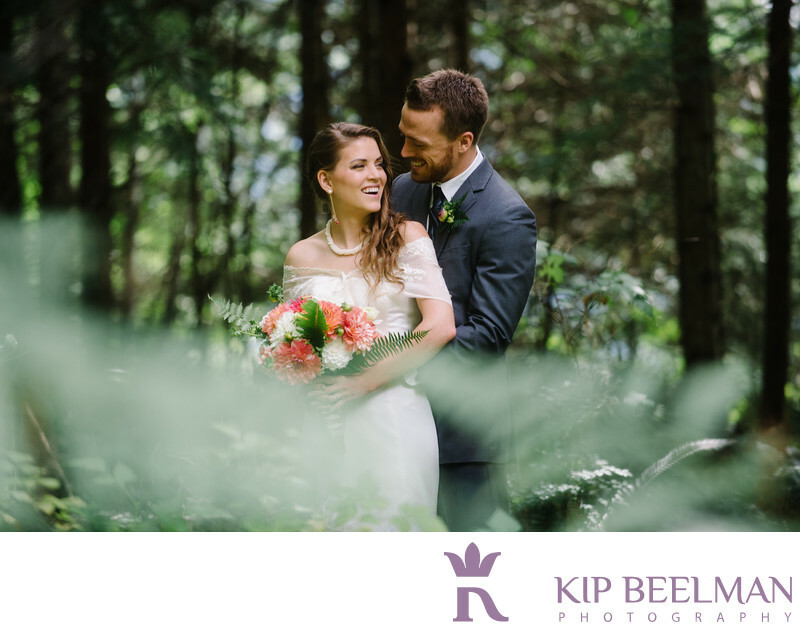 Located on the scenic Rattlesnake Lake with a dramatic view of Rattlesnake Ridge, this relaxed wedding focused on family, photos, connection and the grand outdoors. The couple prepared for the day and enjoyed their first look at each other at the bride’s parents’ house nearby. We then motorcaded to a lush green space to take more photos of the bride and groom and their wedding party along the river. One of my favorite parts of the day was taking a break after that to enjoy a picnic together. This couple appreciates the big and the little things. The Cedar River Watershed Education Center outdoor wedding ceremony was flooded with sunshine and love, and was followed by a meal of finger-licking good smoked ribs and salmon. Location: 19901 Cedar Falls Rd SE, North Bend, WA 98045. Keywords: Forest Wedding (3), North Bend (6), Outdoor Wedding (72).